Perhaps an unusual post but there is so much opportunity to stop, think and notice at the moment. Whether it is relaxing in a café with a cold brew or sipping a take-away in a park. There is time to slow down and ponder. Here are three points that have been puzzling recently. What do you think? Perhaps you have other things that you ponder while sitting in a café? Let me know either in the comments section below, on twitter or on Facebook. 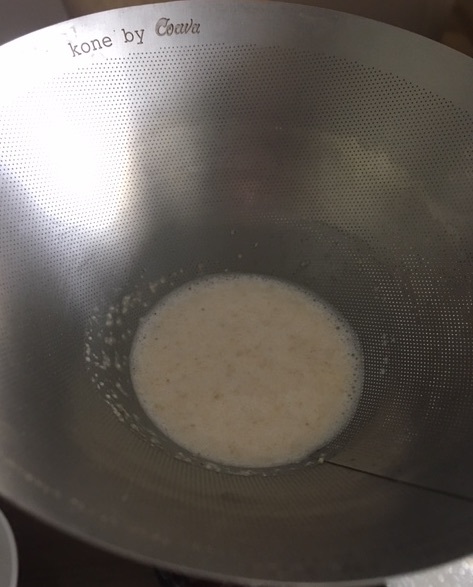 Oat milk filtering through the Kone filter – but what does oat milk tell us about Brownian motion, molecular ‘reality’ and the nature of a scientific theory? 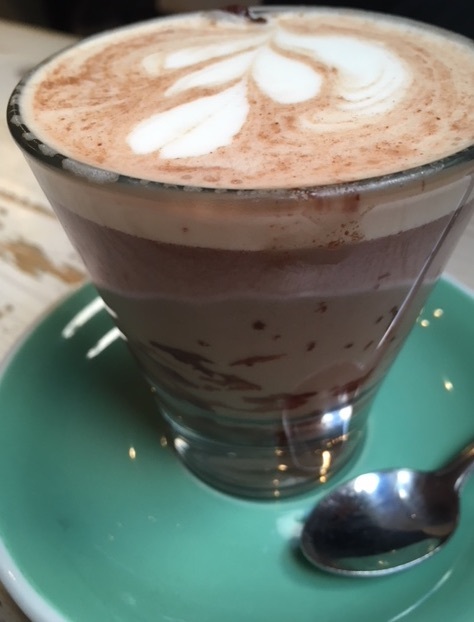 Molecules, the atmosphere and oat milk. 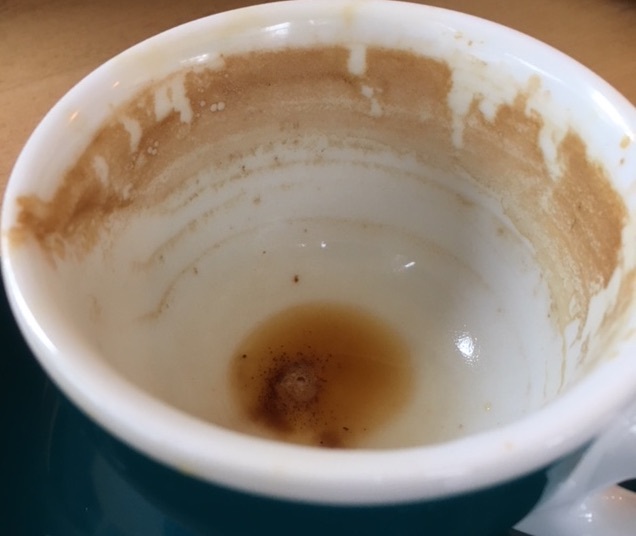 On pouring home-made oat milk into a cup of black tea, it is noticeable that a large part of the oat milk is dense and falls to the bottom of the cup (before being stirred by the turbulence in the tea). A similar phenomenon is found in the rarefaction of gases through the height of the atmosphere and in the distribution of dye in water paint. This latter effect was used to establish the existence of molecules back in 1910. The idea that Brownian motion was caused by molecules had been problematic because there was no way to see molecules in a liquid producing the Brownian motion. The theory linking the two was only developed properly in the early twentieth century. What makes a scientific theory? Is it legitimate to postulate something that cannot currently be observed experimentally? 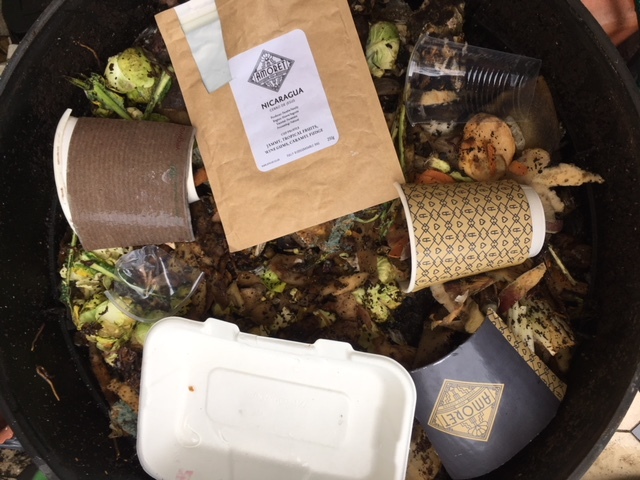 Why does roasted coffee often come in plastic packaging that is unrecyclable and not very reusable? What could prompt a move to a more circular economy. 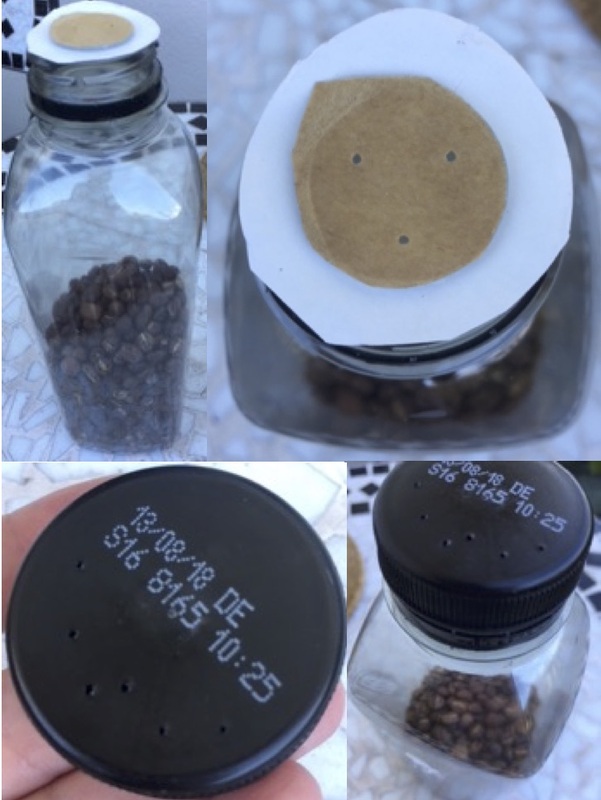 Would it be possible to recycle plastic bottles into coffee ‘boxes’ with an air valve at the bottle top (see pictures). This would increase the recyclability without seeming to affect the taste of the coffee? An idea for a circular economy suitable coffee packaging? Recycled plastic bottles as airtight coffee containers. Related to that, what are your coffee values? Do you favour taste and aroma, traceability, sustainability? Does the packaging that your coffee arrives in feature? Which of these is more important to you? Does the way you drink coffee reflect this? How many people are walking past the café you are sitting in each minute? How many does that translate to per day (accounting for differences in day/night footfall)? Assuming the paving stones remain the same, how long would it be until the successive footprints of all these people caused erosion of the pavement surface? What are the implications of this for the geological features near you? Whatever you think about in a café or while drinking a coffee, enjoy your time taken out to think. Perhaps you will notice something (or realise something) very interesting or noteworthy and if you have any thoughts on any of the above do let me know either in the comments, on Twitter or on Facebook. What is it that makes a great café? 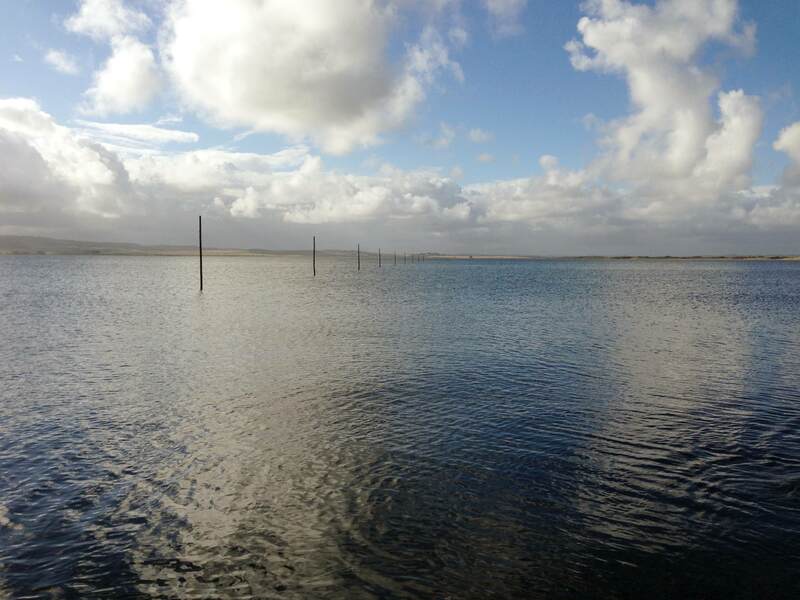 A space to slow down and think? 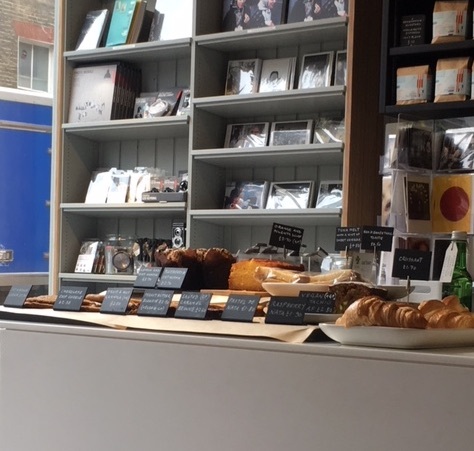 Good coffee and cakes? A local business that forms part of its local community and gives back to that community in different ways? 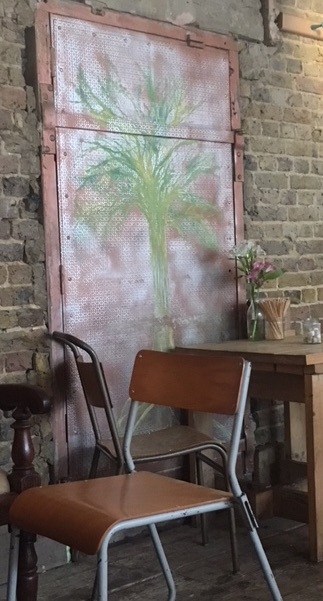 As I was looking around for a new café to try, I was reminded of Sugar Pot in Kennington. Their website suggested that it ticked all of these boxes and so I was eager to try it (so eager in fact that I didn’t note the opening times, they close at 3 on week-days which is a problem when you arrive at about 2.55). 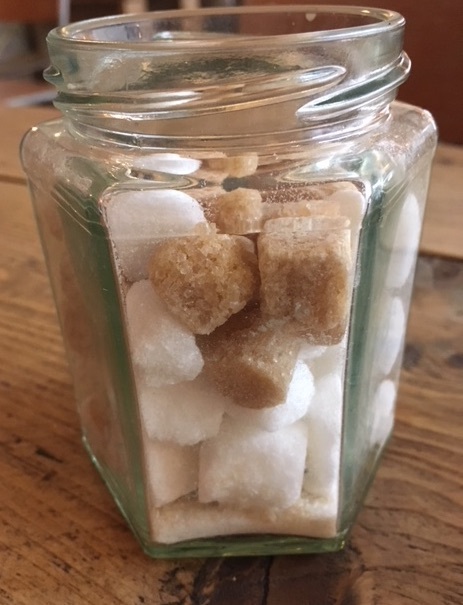 So a second attempt at trying Sugar Pot was arranged, this time safely before lunch. This time, in the morning, there were quite a few chairs and tables outside the café in a roped off area of the street. (We hadn’t noticed this on the first occasion we visited as they had all been piled up inside the shop by the time we arrived). Most of these tables were occupied indicating that it is clearly an attractive place for locals to meet and chat over coffee. 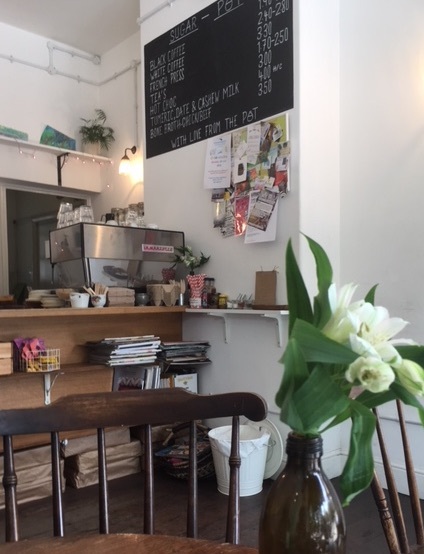 Fortunately there were also a fair number of tables inside which suited us as a café often offers more to ponder inside than out (though outside offers a different perspective particularly for people watching). Inside, each table has an individual character and one in particular offered several points to think about both in terms of physics and aesthetics (you will have to visit to understand). However, it was elsewhere that my attention was drawn that day. 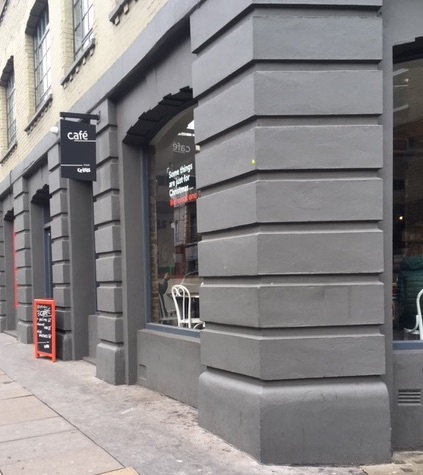 Coffee is roasted locally by Cable Bakery while the cakes are from John the Baker of the Kennington Bakery. 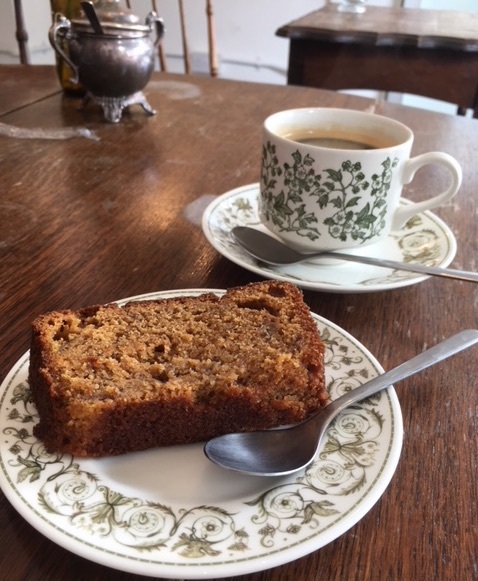 Sugar Pot definitely gets a tick in the “allergy friendly” box because they answered confidently (and with required caveats about traces) my dreaded question “does it contain nuts?” So I was able to enjoy a lovely slice of banana bread with my coffee. 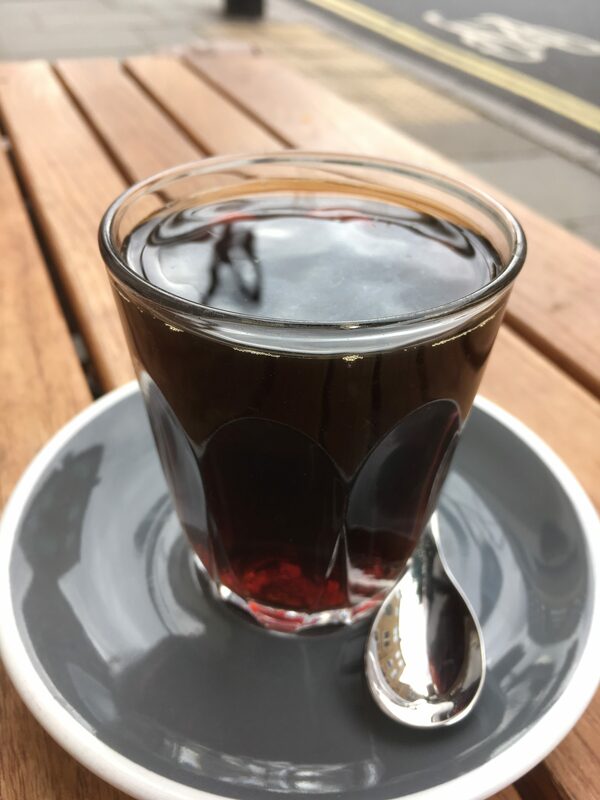 Most of the usual espresso based drinks are available (but not listed on the menu) together with a French Press coffee for those who prefer a non-espresso brew. I do not know if he really did say this but it is a sad reflection on our society that rather than address our environmental crimes we are researching pollinating with drones. However, it turns out the the bee has a much more exciting, almost shocking, link with physics and one that I only discovered thanks to the excellent book “Storm in a Teacup” by Helen Czerski¹. The bee is indeed a very positive creature. Whether or not they have a happy disposition, it seems that 94% of bees are, electrically speaking, positively charged². They pick up a static charge while flying through the air in a similar way to a balloon being rubbed on your hair. Flowers meanwhile have a negative charge meaning that in addition to colour, shape, scent and pattern, bees can recognise flowers by their electric fields. These fields in turn mean that pollen from the flower ‘jumps off’ and adheres to the bees fur before the bee has even landed, increasing the efficiency of the bee as a pollinator. But it turns out that there is much more to it. 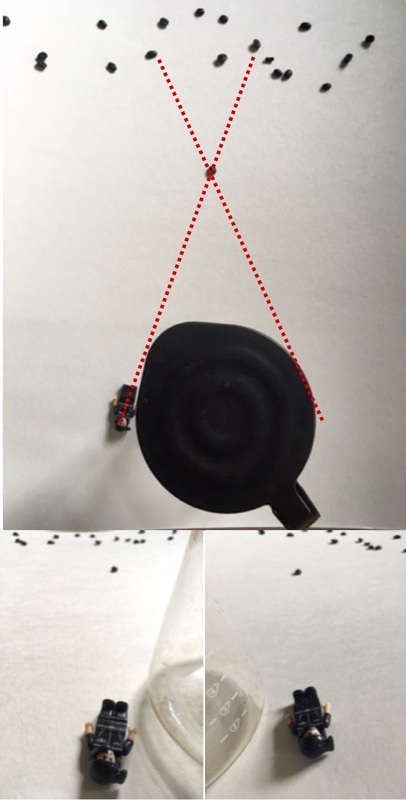 When the positive bee lands on the negative flower, there is a charge transfer that results in a change of the electric field around the flower for a duration of 100 seconds or so. By constructing artificial flowers held at different voltages containing either a sugar reward or a bitter centre, researchers at Bristol university found that bees could learn to recognise which ‘flowers’ contained the sugar and which were too bitter to be visited by sensing the electric field around the ‘flower’. 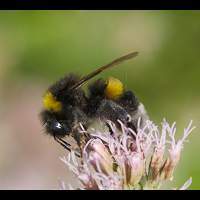 It suggests that the changing electric field of real flowers provides a mechanism by which the bee can recognise if a flower has been recently visited by another bee and so been recently pollenated. This would mean that by ‘feeling’ the electric field of the flower, the bee may decide that it would be more rewarding to carry on to a differently charged flower. You can read more about the research in the paper here. It seems to me that learning about how the bee senses its environment reveals even more about the amazing way that nature (and physics) works. And this offers a link back to Sugar Pot. On the shelf behind the counter back at Sugar Pot was a card that had the message “Keep safe, live to be”. What does it mean “live to be”? In the environmental encyclical Laudato Si’, Pope Francis urges everyone to slow down and notice things such as the bee commenting that “If someone has not learned to stop and admire something beautiful, we should not be surprised if he or she treats everything as an object to be used and abused without scruple.” He goes on “… when media and the digital world become omnipresent, their influence can stop people from learning how to live wisely, to think deeply and to love generously… True wisdom, as the fruit of self-examination, dialogue and generous encounter between persons, is not acquired by a mere accumulation of data...”³ Which is one reason that in order to be, we may want to come back and take a closer look at those bees. 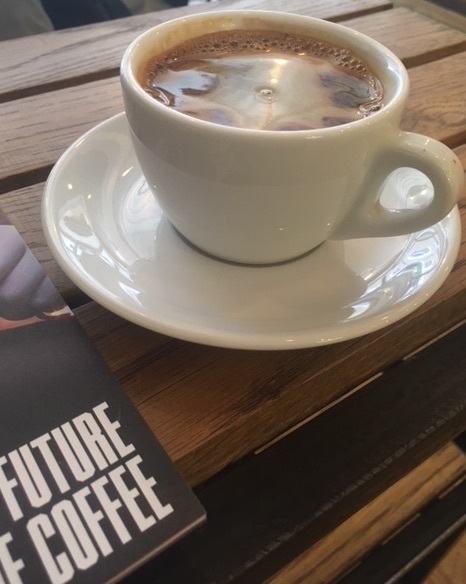 Taking time to experience our coffee in a relaxing space such as Sugar Pot and to watch and ponder as the bee uses senses of which we are barely aware can never be a waste of our time. Indeed, it is possible that our world may depend on it. ² Clarke et al., “Detection and learning of Floral Electric Fields by Bumblebees”, Science, 340, 6128, 66 (2013). ³The passages quoted are from paragraphs 215 and 225 respectively of Laudato Si which can be read online. The problem is oat milk. 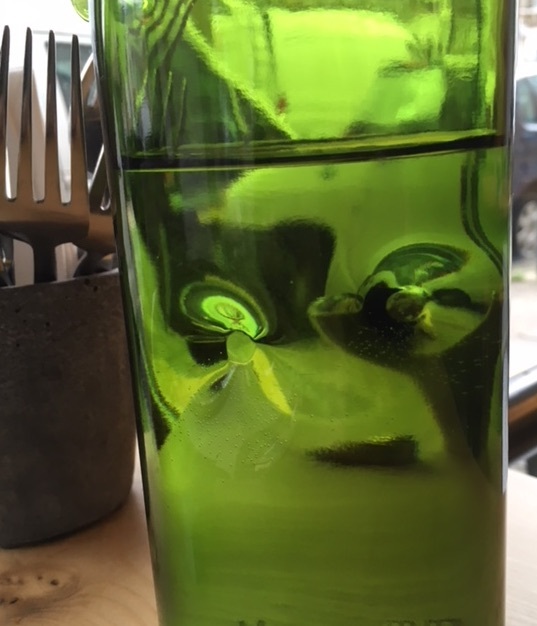 If you are having a go at living plastic free (or even reducing your reliance on single use plastic) during Plastic Free July, you have probably encountered at least one sticking point. Something that you are finding a little tricky to let go of. There are things that are too difficult to eliminate right now (meat/fish packaging is one example although there have been efforts to change this in some locations) but these are not necessarily sticking points. No, sticking points are things that seem that they should be easy to eliminate but for some reason are not. For me this is oat milk. For the past three years, I have been participating in Plastic Free July with the aim of trying to find ways of living that reduce my plastic waste. And for the past three years, the problem has been oat milk. It is becoming a bit of a nemesis. Although proper, dairy based milk is available in glass bottles, this does not appear true for non-dairy based milks. Although some packaging can be recycled, it is a significant contributor to my waste pile. So, how about home made oat milk? It should be easy shouldn’t it? Oat milk filtering through the Kone filter. You can find plenty of recipes for oat milk online (a few are here, here and here) but I’ve always found it messy and, well, wasteful. The worms have enjoyed the oats in the past but surely there’s something better that can be done with them? Well, this year, things seem a bit different. And part of that is because of a coffee filter. Years ago I tried the coffee Kone filter as an attempt to reduce my use of paper filters in the chemex. Sadly, I didn’t get on with the Kone. Unlike a paper filter, some sediment made it through the filter leading to more of an immersion type coffee drink rather than a filter. Consequently it went to the top of a cupboard and lay forgotten for a few years. 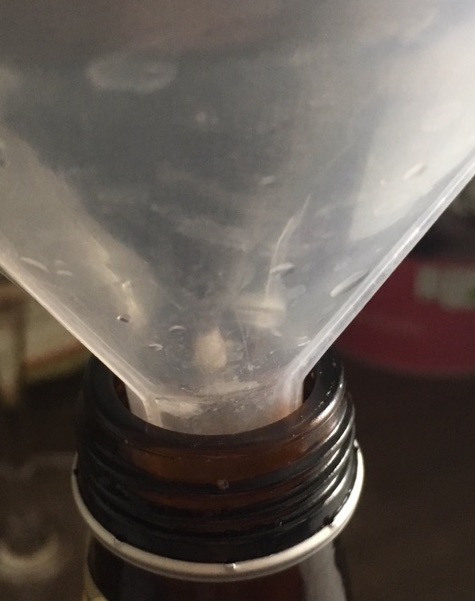 Until this June when I re-discovered it as a filter for the oat milk. Rather than a muslin bag, the Kone can be cleaned easily and the whole process is significantly less messy (and slightly quicker – stirring the contents of the Kone with a spoon is easier encouragement to get the oat milk through than squeezing the muslin bag). Although there remains significant work before this can start to be a habit rather than just for a month, this July’s oat milk is a lot more promising than previous years. I’ll keep you updated as to whether the oat milk remains being home made in August. Preparing your own dairy-free milk also offers new opportunities for watching physics such as the pitch-drop experiment here. In the meantime, do let me know how you are getting on with your own Plastic Free July. Do you have any sticking points? On the other hand, are you finding that you are enjoying taking your re-usable cup around with you when you get a take-out coffee? Also, if you have any recipes for things that can be done with these left over blended oats. I’d love to hear of your culinary experiments. In the following recipes, because I do not know how much oat milk you are making, I’ll call the amount of blended oats X g. In my experiments X has been either 115g or ~60g. Mix the blended oat left overs with the sugar and then stir in the flour, baking powder and spices. 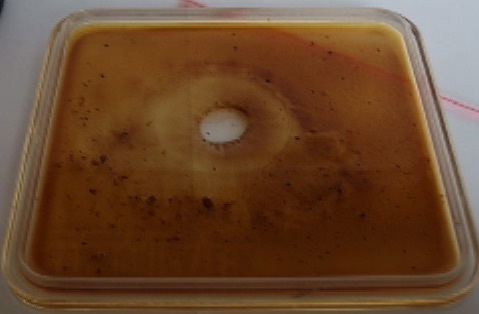 Spoon onto a greased baking sheet so that they make circular blobs of about 3cm diameter. Place the apple pieces into the mixture and bake at 180C for about 15 minutes until risen and slightly browned. X/2 g flour (but this isn’t really necessary). Mix everything together, spoon into a lined and greased baking tin, bake at 190C for 15 minutes until firm. Keeps in an airtight container for days. Not quite there yet. If you have a better recipe or can improve this one, please let me know. 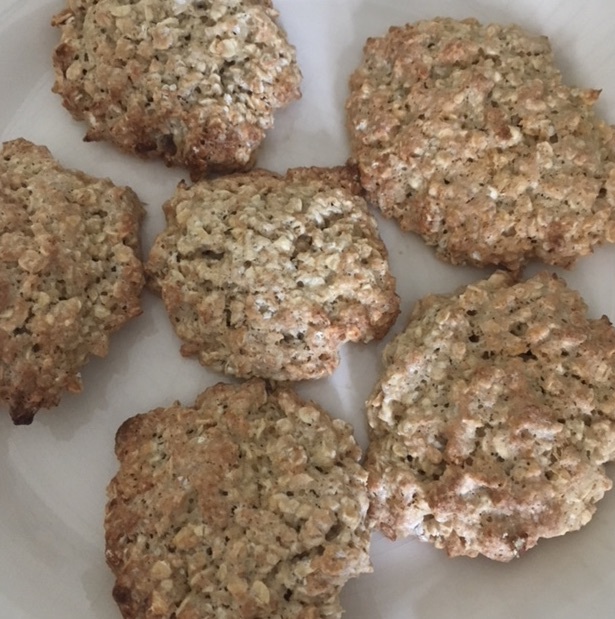 A work in progress – the quantity of oats is not right yet and perhaps they need to be toasted oats or even spelt flakes. Mix the blended left overs, sugar, flour and baking powder together. Stir in the oats. Spoon on a lined and greased baking sheet so that you get ‘biscuit sized’ portions. Bake for 25 minutes at 190C or until brown. 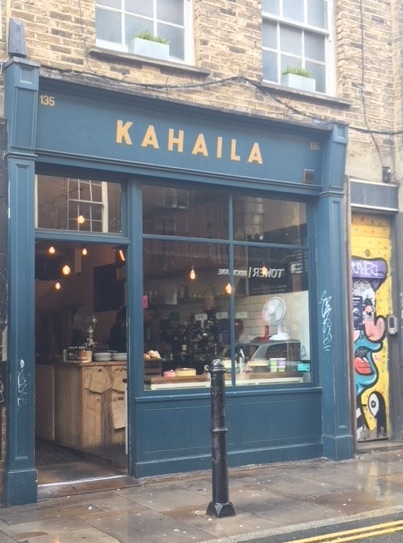 Kahaila on Brick Lane. 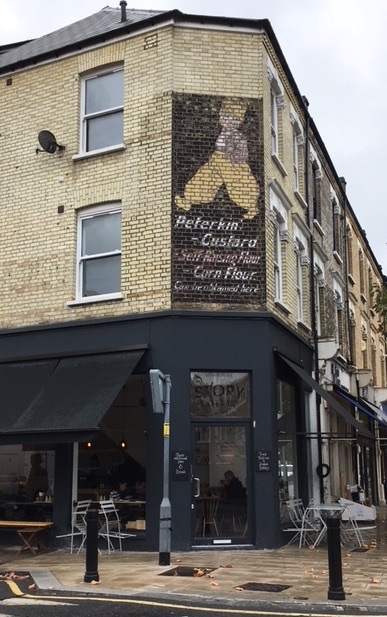 A small shop front concealing a large interior. 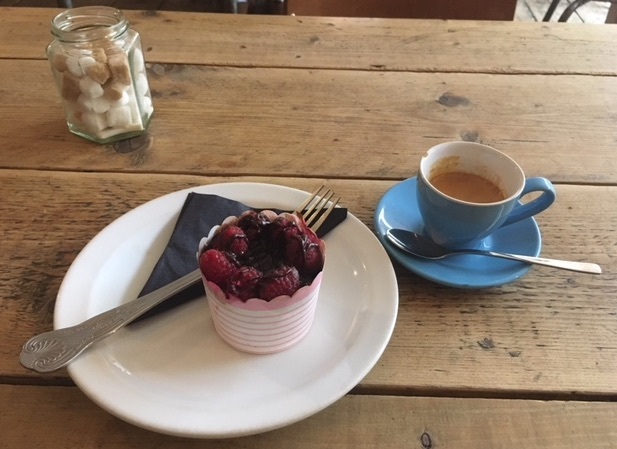 It’s always great to find an independent café selling good coffee (and cake) while giving something back to the community. It’s a reason to seek out small businesses rather than chains. Kahaila café on Brick Lane absolutely falls into this category. Although I had visited Kahaila previously, on that occasion the beigels (almost) next door were ‘calling’ and I did not give this space the time it deserved. This time however, the beigel shop had come first allowing us plenty of time to sit and ponder in this spacious café. I had an espresso (toffee notes) together with a raspberry topped vegan chocolate cake (confidently nut free). There were a large variety of alternative cakes on offer at the counter along with cold drinks should you want them in summer. The espresso was a very enjoyable accompaniment to the cake (or should the cake be an accompaniment to the coffee?). The large room at the back of the café offered plenty of seating and was well lit by sunlight streaming through a window built into the roof. Raspberry vegan chocolate cake with espresso. 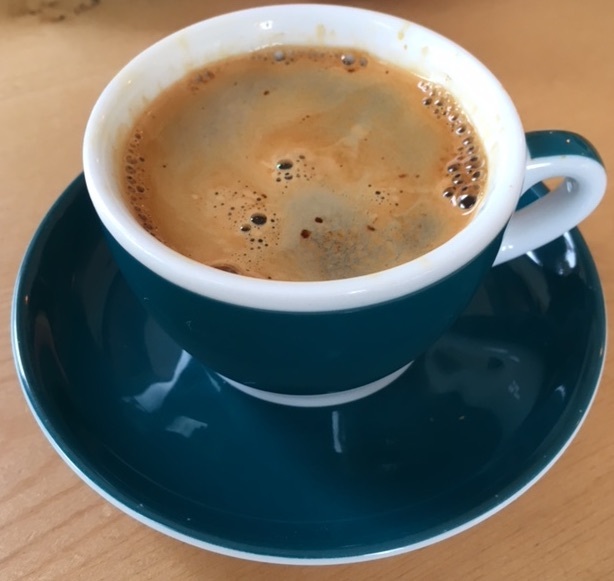 The blue cup can affect the way the coffee is experienced. 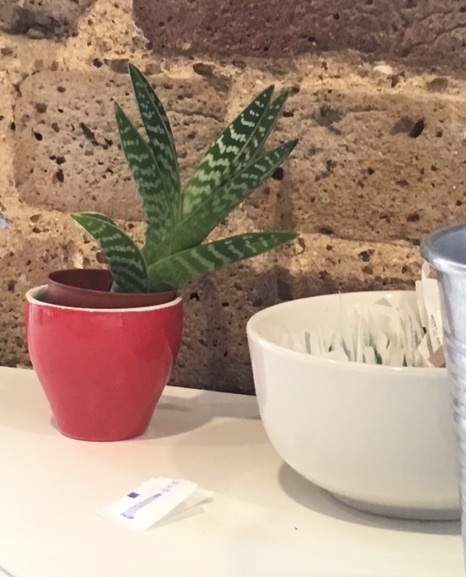 One thing that immediately makes this café different from many others, is the fact that there is a donation box on the wall. Information cards on the table tops explain that Kahaila works as a charity providing education and support to women prisoners, helping women who have experienced abuse or are vulnerable in other ways to learn skills in a bakery and also offering a safe house for women who have been victim to exploitation and trafficking. All in all a café in which it would be good to spend more time (if only it were closer!). And assuming that the cakes are from the bakery, it forms a giving-circle with some great bakes on offer. The vegan chocolate cake was a case in point. Beautifully presented, balanced in taste, in a perfectly sized portion to enjoy with a coffee. Ordinarily cakes require butter and eggs, how did the bakers manage it? Of course, a recipe was not given at the counter, nor would it necessarily have been particularly helpful to answer the question. Because the answer, if one exists, is a mix of their experimentation with flavours and textures together with an advancing knowledge of what each cake ingredient does. Consider the egg yolk. In addition to adding mouth feel and texture to the cake or biscuit, the yolk contains emulsifying agents, such as lecithin, which act to stabilise suspensions of oil in water¹. With a hydrophobic section at one end of the molecule and a hydrophilic section elsewhere, the presence of lecithin molecules in the mixture prevents droplets of oil from grouping together and coalescing so as to separate into oil/water layers. By experimenting with non-egg based lecithin, a baker can combine different flavours and textures to produce a vegan cake. A few years ago, a somewhat similar problem was vexing materials scientists: how to remove toxic lead from piezoelectric devices. Piezoelectric devices expand or contract when they are subjected to an electric field. This makes them useful for moving mechanisms such as watches and even as a way to open/close hot water valves in coffee machines. 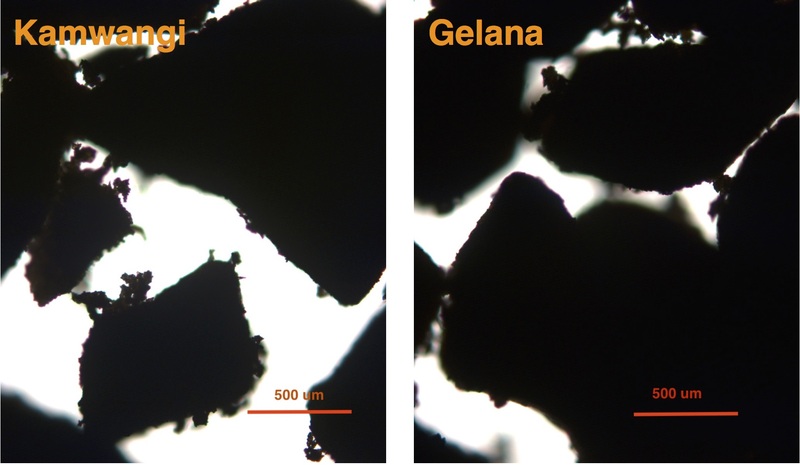 The problem was that one of the best piezoelectric materials we had was lead zirconate titanate (or PZT for short). In order to make the PZT material, the lead had to be sourced in quite large quantities and yet, being toxic and environmentally damaging, it was considered advantageous (even necessary) to remove the lead. A painted doorway inside Kahaila in combination with flowers in front suggests a thought train about the way bees see. However, just like the egg yolk in cookie recipes, you cannot just remove it and produce the same sort of effect in the finished product. You need to understand what role the lead was playing in order to be able to substitute it properly and even then, the effect may not be as good as the original ingredient (without some tweaking elsewhere in the recipe also). Consequently a lot of research has been undertaken in order to find new piezoelectric materials and to understand them so as to optimise the piezoelectric effect. Partly this involves adding the new ingredients slowly to understand their role. Partly it involves changing the growth conditions (somewhat equivalent to the baking temperature) in the crystals that are made. Always it involves experimenting and understanding the role that different ingredients play in our final devices. 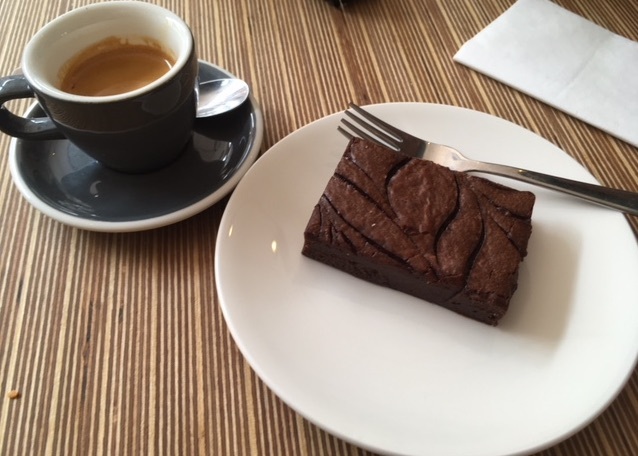 An espresso using coffee from Redemption Roasters and a chocolate brownie. What more could you ask? Many years ago, there was an aquatics shop on the site of what is now The Observatory, a combined photography gallery and coffee shop. Although there is plenty to see through this glass fronted café, you do not feel that you are in a goldfish bowl so much as that this is a space created for you to slow down and contemplate your surroundings. The large rooms and comfortably spaced tables do, of course, give the opportunity for people watching: when we visited, there were people working with their laptops on some tables while others were having business meetings. Then there are the photographs, currently (though only for a few more days), an exhibition of photographs from the 60s and 70s by John Bulmer. 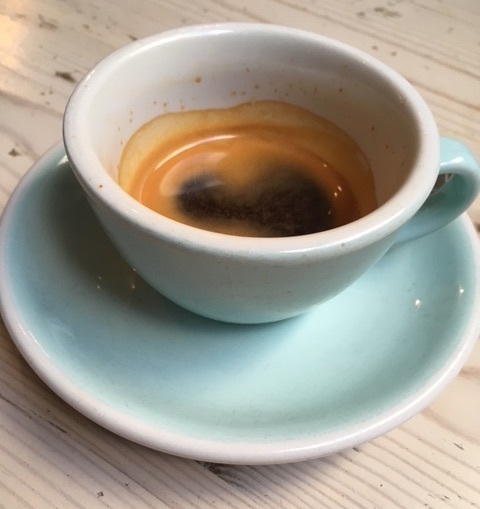 The coffee is supplied by Redemption Roasters and I enjoyed a dark, toffee like espresso with a very good slice of a chocolate brownie (confidently nut free). Several types of milk are on offer for milk based coffee drinks as well as a selection of cold drinks, together with a wide variety of cakes. It is definitely a place to return to when in the area. Cakes on the counter at The Observatory. Note the twin lens reflex “camera” on the shelf behind the counter. While waiting for my coffee, I noticed the grain of the wood in the table. Dark, almost parallel lines on a lighter wood. 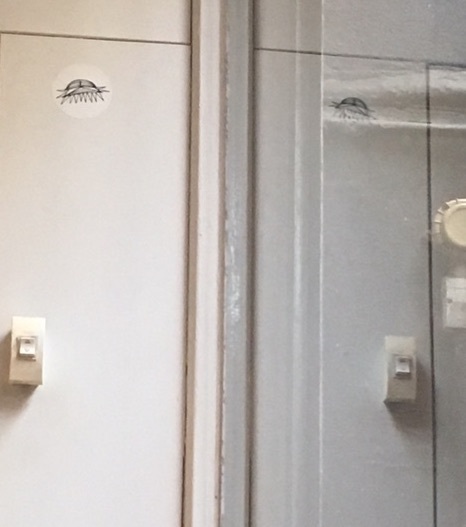 You can see it in the photograph. 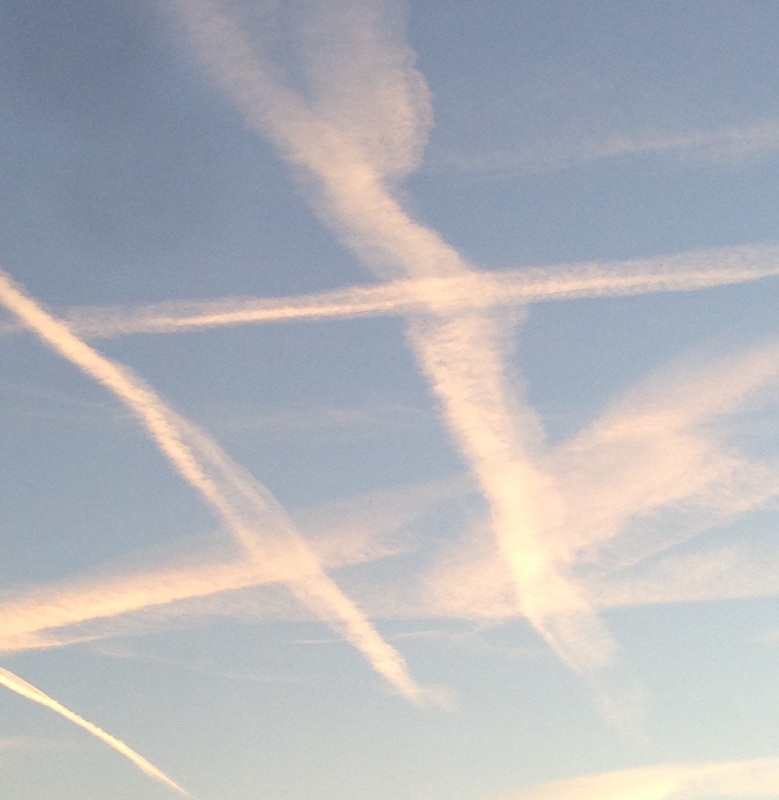 Looking around the café, such parallel lines were everywhere. 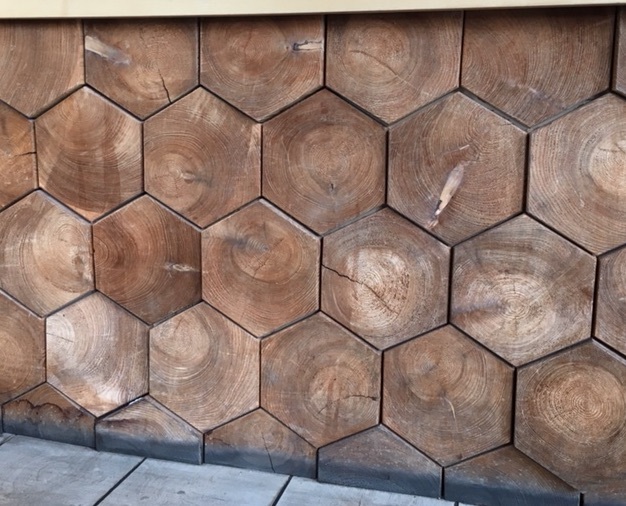 Planks of wood lined the walls, vertical, parallel lines stretching up to the ceiling. 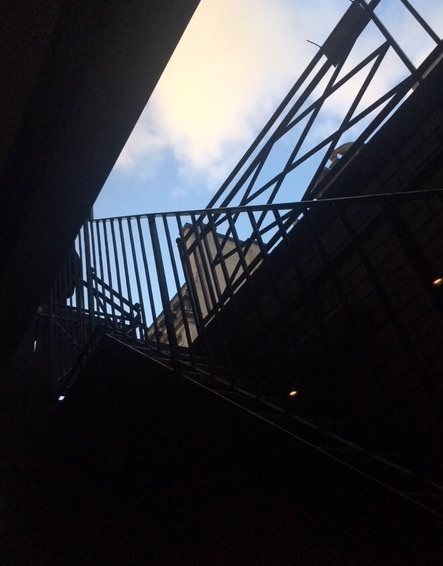 In the room towards the back of the café, the ceiling also had parallel lines on it which, given I was viewing them from a distance, appeared to converge with the effect of perspective. It is difficult to know whether these effects were deliberate in a gallery/café so dedicated to an exploration of the visual but I like to think that the small twin lens reflex camera on a shelf (which sadly turned out to be a pencil sharpener on sale) was a nod to this idea shifting lines of sight and perspective. By definition, two parallel lines are lines that will never meet, no matter how far the lines are extended. If they were to meet at any point, they would not be parallel. This offers a way of measuring the distance to stars as well as providing food for thought on our way of seeing our place in the universe. The idea is that of parallax. If you were to measure the relative position of a star against the background of stars at midnight in June, and then go back to measure the same star relative to the same background at midnight six months later in December, you may find that the star seemed to have moved. The amount it moves, its parallax, is determined by how close the star is to the earth (have a look at the diagram). 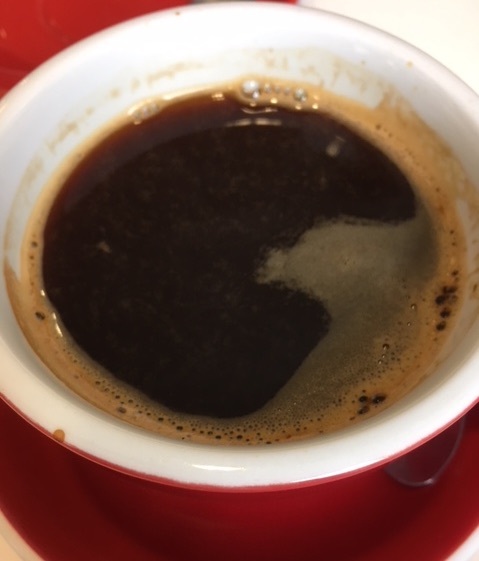 As the point of view moves around the Sun (represented here by a V60), the closest coffee bean appears to shift relative to the background coffee beans. The lower two diagrams are an attempt to see things from the perspective of the Lego person separated by “6 months” distance. Take as an example the star Sirius. Located relatively close to us at a mere 8.6 light year distance, Sirius has a parallax of 0.38 arc seconds or, equivalently, about 0.0002 of the angular diameter of the moon viewed from Earth¹. Stars that are further away are going to have an even smaller parallax until the parallax becomes so small as to be difficult to measure. Even for nearby stars such as Sirius, the small size of the effect meant that it wasn’t until 1838 that it was first measured. Which may be part of the reason that the theory of Aristarchus (310-230BCE) never caught on when it was proposed. Aristarchus was an early proponent of the idea that the Earth went around the Sun (and not the other way around). The Greek’s realised that if Aristarchus was correct, there should be a parallax effect for the stars viewed at different times of the year (every 3 months)¹. Unfortunately, the Greeks also considered that the stars belonged to a thin shell, so effectively all the stars were at the same distance from the Earth. Consequently, the parallax effect that they looked for (if Aristarchus was correct) was for two stars on that shell to move first towards then away from each other as the Earth circled the Sun¹. They never observed this effect and so considered the heliocentric theory “inconsistent with observations”¹. Although we would now say that the fact that they didn’t observe any such shift is consistent with the huge distances to the stars (and therefore small shifts) involved, for the ancient Greeks it was a problem. As Archimedes commented, if Aristarchus’ theory had been true, it would mean that the universe was much bigger than they at that time thought. Guardini has written about the effect on the human psyche of this changing idea of the universe and our own place in it (from the Greek’s idea of finite and limited, to finite with a God outside, to infinite and back towards finite but incredibly large). Do our ideas, our models, about the universe affect not only how we interpret the experimental evidence we see, but also our way of being, our behaviour towards our fellow humans and our planet? Viewing things from a different angle, seeing the effect of a change of line of sight, it brings us right back to the photography in the gallery and the twin lens camera on the shelf. There are certainly many things to contemplate while enjoying a coffee at The Observatory. Which means a second espresso should definitely be a possibility. You can view some street photography, including some photographed with a twin lens Microcord TLR camera on Artemisworks gallery here.